SummerSlam, WWE's four-hour extravaganza commences from Brooklyn, New York this Sunday night. It only makes sense that if WWE is going to make SummerSlam a four-hour extravaganza that like WrestleMania that they appropriate the phrase "Road to SummerSlam" for the biggest event of the summer as well. Chief Operating Officer Triple H announced at the outset Monday that the road to SummerSlam would begin on Monday Night Raw. In truth, the road to SummerSlam began five weeks earlier and has progressed pretty nicely. Most of the 10 matches on the card have received a relatively good build-up over the past month-and-a-half, even if there was some subpar Monday's along the journey. Monday's episode tied things together, made the hard sell and superbly managed not to derail the momentum. There are bound to be a clunker or two at SummerSlam, but fans should get a great event—provided they can get through four hours of entertainment. The extension of the show to four hours, the inclusion of a celebrity 'host' in the form of familiar face Jon Stewart, and the booking of a huge, marquee main event in Brock Lesnar versus The "vengeful and revengeful" Undertaker are all deliberate steps taken to ensure that SummerSlam has a decidedly grander feel than usual—but scale is no guarantee of success. A number of key questions need to be answered: who should prevail in the Lesnar-Undertaker spectacle, should Cena be allowed to conclude Seth Rollins' title reign, and—of course—what on Earth is Sheamus still doing in control of the Money In The Bank briefcase? 1. Roman Reigns Heel Turn? In truth, it's hard to envision a future where WWE fans accept a babyface Roman Reigns as the face of the company—as long as he continues down the same path, at least. If you beg to differ—see the recent incident where a replicate Money In The Bank briefcase was catapulted at Reigns' head! Speculation has circulated on wrestling forums and messageboards recently that Dean Ambrose could turn heel instead of the 30-year-old, although the latter is easily the better fit. Reigns was the overall heel badass alongside his former comrade in The Shield and, he's the babyface in greater need of a heel turn if we're being honest, supplying him the opportunity to reinvigorate his continually tedious character. As I said, Reigns should turn heel and the four-hour extravaganza should most definitely be the place for it. First of all, as it's undoubtedly the biggest event of the summer it'd happen for plenty to savor and—of course—Dean's and Roman's expanding "bromance" would make the betrayal all the more shocking for the WWE Universe to inhale, especially if Roman then aligned himself with their PPV opponents, the Wyatt Family. I would not be against the furore of Reigns turning heel at SummerSlam and it's a possibility that you should look out for. Ever since her separation from the Bulgarian Brute, Rusev, Lana has suffered a serious depreciation in character. She's unnatural as a babyface, and her pairing with Dolph Ziggler just hasn't worked unfortunately. Ziggler was put on the shelf for a lengthy period due to his involvement in an upcoming film, hence the feud was left without sufficient fuel. Why toil on something that just isn't working? If the ringside cheerleader shockingly abandons the American, it's highly unlikely she'd then align herself with Rusev once more. Lana turning on Ziggler would send the story of in a less predictable direction, supplying her an opportunity to become the major female star WWE envisioned her as in the first place. The return of the "Cesaro Section" fliers at recent WWE events has surely been a welcome for ardent fans of The Swiss Superman. WWE have taken persistent acknowledgement of the small fliers that abruptly appear as the babyface character makes his scripted introduction over the past couple of weeks. As a result, the multi-million company has rallied behind Cesaro by pushing the organic craze, taking the fan-movement and commercializing it. On Monday—during the Cesaro/Randy Orton Kevin Owens/Sheamus bout—the announcers made sure to ceaselessly call attention to the "Cesaro Section" in the audience, acknowledging the signs and the boisterous chants from the fans. The Swiss international faces Kevin Owens at the four-hour event—one which has the potential to be an enthralling bout. Be sure to look out for the "Cesaro Section" contingent on the night. One of the most anticipated matches on the card, the battle between Cesaro and Kevin Owens at SummerSlam could easily steal the show: Each superstar is doing excellent work at the moment, and the heat they currently have is combustible, capable of exploding at any given moment. It's imperative that Kevin Owens picks up the victory as it's easy to give the Canadian-born heel a tainted triumph. The WWE Universe seeing the babyface, Cesaro, get cheated out of a victory would build even more sympathy. Besides, it's too early in the feud for The Swiss Superman to be overcoming Owens, and the Brooklyn crowd will react favorably to this contest regardless of who wins. Owens is the undoubtedly hottest property to emerge from NXT since The Shield, and, pushed 16-time World Champion John Cena to the limit on three occasions. He's coming off back-to-back PPV losses to Cena, and he will likely end up losing to Finn Balor in the NXT Championship Brooklyn bout the night before SummerSlam, while Cesaro can out-wrestle almost anybody in the locker room. Additionally, look for this match to be the undercard classic of the night. If given the substantial time it deserves, it could very well be the best bout of the night. In truth, the Prime Time Players have become decidedly more popular since winning the titles for the very first time at Money In The Bank. Darren Young and Titus O'Neal have really grown into their roles as light-hearted babyface champions, but have failed to connect strongly with the audience due to a lack of promo time and progression of their personas—and that's why The New Day should retrieve the gold at SummerSlam. Kofi Kingston, Big E and Xavier Woods have struck gold thanks to their natural charisma and commitment to the gimmick. Since being dethroned by Darren Young and Titus O'Neal, The New Day has gotten even better. Their heel characters are more defiant, more brazen, but still grounded in the gimmick of positivity. They're dedicated to their silly characters and play their parts to perfection, which is why they never cease to elicit a reaction from the audience. They face the Prime Time Players, Lucha Dragons and Los Matadores in an unprecedented Fatal 4-Way bout for the straps. One senses Theodore Long would approve! 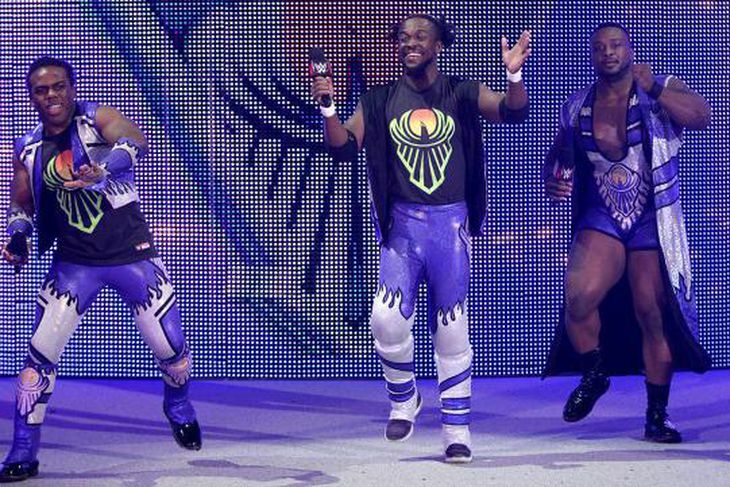 If The New Day lose but don't get pinned, it'd be the way to keep the wacky and fun trio in contention. Of course, it can't be long before their happy-go-lucky act begins to wear thin. But their chase to retrieve the gold has been by far the best story in the tag division, as it's made the trio more sinister, and The New Day should find themselves regaining their titles at SummerSlam. Nevertheless, the other pairings involved in the bout, while talented, have not formed a durable connection with the audience. The Prime Time Players, Darren Young and Titus O'Neal, have been overdue a title reign for over three years, but WWE hasn't done much to endear them to the audience other than win meaningless matches. Upon making their debut the night after WrestleMania 31, The Lucha Dragons looked a fresh babyface duo that was hitting its stride at the perfect time. But their TV time has been largely limited, thus has neutralized fans from forming a durable connection with the breakout stars. Last, and most definitely least, we have Los Matadores. A tandem that seems to have been miscast as babyfaces, they have not served any sense of purpose since arriving on the scene close to two years ago. Primo and Epico are excellent athletes, we already know that, but it's evident they're in desperate need of a gimmick overhaul if the want to be taken seriously. Furthermore, The New Day are among one of the best acts in World Wrestling Entertainment today and, they're the only team in that Fatal 4-Way that fans truly care to see win. It's a seemingly depleted division at the moment; it's a mess, and all in all, it's a lackluster bout because a handful of the participants have paltry to fight for. Make no mistake: Appreciation of Jon Stewart has been an all-time high following his departure from The Daily Show, the charismatic TV personality after 16 widely lauded years at the helm, but steps must be taken to ensure Stewart does not take attention away from the main product, SummerSlam—regardless of how beloved and beguiling the American comedian/presenter may be. The Rock, at WrestleMania 27, for example, brings back uncomfortable memories of his appearance as 'host' of the biggest event on the calendar—widely condemned as one of the weakest and grisly Mania's in recent memory. "The Most Electrifying Man In Sports Entertainment" overshadowed the show itself, his direct interference with the main event setting up his controversial rivalry with John Cena. It's been made clear over the past couple of weeks that WWE's summer extravaganza will decidedly be a secondary WrestleMania, and the involvement of Stewart as 'host' as well as Green Arrow star Stephen Amell further emphasizes that. But it's imperative they don't overshadow the biggest event of the summer, regardless of how charismatic and exalted both Stewart and Amell really are. It's nice finally seeing acknowledgement of the talent in the Divas Division. Sasha Banks, Becky Lynch and Charlotte have looked a fresh of breath air since arriving on the scene. The roster is as deep and loaded with female talent as it ever has been. On July 13, a group that already included Paige, Naomi, Tamina Snuka and the much-improved Nikki Bella added three potential centerpieces in Banks, Charlotte and Lynch. This isn't one or two top wrestlers surrounded by fluff and filler; this is a legit division. Sasha Banks, the current NXT Women's Champion has made a major impact since turning up on the main roster, and seems to have quickly established herself as the leader of Team B.A.D. Banks wrestles with such flair in her performances, and she already looks to have skipped to the front of the queue to take down Nikki for the main prize in the Diva's Division. Becky Lynch has also been an impressive graduate. She commands an august presence inside the squared-circle, but since her arrival on this platform, the Irishwomen has not made as dramatic an impact as the rest. Last, but not least, Charlotte. Her family tree—she is the daughter of WWE Hall Of Famer Ric Flair—naturally creates a pathway and connection for her and WWE fans. The former NXT Women's Champion's talent is unquestionable, and her performances have most definitely piqued the perusal of plenty since making her debut on the main roster. The Diva's Division, for one, isn't centered on a savior. There's an electricity encompassing WWE's women of a much higher voltage than normal. A woman's division bolstered by earnest attention and the opportunity is a very real one that is no longer just something fans pine for—it's in motion at this very moment. Seth Rollins' immediate future as WWE World Heavyweight Champion looks probably safer than it's been for a long time at the moment. A winner-take-all scenario for either Rollins or John Cena at SummerSlam on Sunday night does sound august, but it's not really necessary. Rollins' title reign has began to grate, but it continues to diminish by ineffective booking. It deflates interest in his future bouts. His title-for-title bout versus John Cena at SummerSlam won't feel like a superfight between two titans, as Rollins has been far from a titan. That's a designation reserved for guys like Cena. With too much focus on Rollins' cowardice rather than his cunning, his reliance on stooges (currently on the shelf) instead of the sharpness of his own fangs, WWE has gutted the power of his title reign. It's understandable why Vince, Triple H and Co. have stuck a stipulation and some kind of perennial ramification on this bout, title-for-title, for the biggest event of the summer. But Cena easily has the upper hand here. Just when it looks as if Rollins, the cackling heel will beat his opponent mercilessly and decisively like he did against Dean Ambrose back at Money In The Bank, the script has him lose, scatter like a roach or stumble along as Champion. Versus Brock Lesnar at Battleground, by far the biggest bout of his career, Rollins seemed to have been vaporized when The Undertaker abruptly appeared out of the darkness. The main focus was on Taker's subsequent attack on The Beast Incarnate; Rollins was just a pawn to sell a much huger bout. If Rollins takes all, there's only one way he'll win: cheaply. It would make perfect sense if Kane interfered at SummerSlam. If Taker defeats Brock, it's because Demon Kane seeks vengeance on the man who broke his ankle and Lesnar can't repress the Brother's Of Destruction. Could be a Brothers of Destruction reunion at #SummerSlam, Brock Lesnar did injure Kane after all. And that's where Sting comes in. An appearance from The Vigilante at SummerSlam 2015 could lay the groundwork for an eventual WrestleMania dream bout against The Undertaker, and the SummerSlam main event bout between Brock Lesnar and Taker could get convoluted. Of course, this is an angered, scorned, vengeful Undertaker. It deviates from the usual Taker, although he seemed pretty provoked and scorned at WrestleMania 30 as well. Then he became the old, concussed Undertaker. But WWE are seemingly really plunging Taker as scornful, and he's hit Lesnar with low blow's on two separate occasions already, indicating he knows he can't defeat The Beast in a straight-up, one-on-one matchup. He should really fight dirty in Sunday night's main event. A desperate man scrimmaging to regain his yard. With his brother, Kane, also suffering an injury at the hands of The Beast Incarnate, the WWE Universe should expect a reunification of the Brother's Of Destruction. As Kane and Taker join forces and mercilessly trample Lesnar, that's when the arena should turn black and The Vigilante makes his appearance. Should Undertaker vs. Sting at WrestleMania come to pass, it will be built on pageantry and star power, on bells, whistles, flash and everything that makes up pro wrestling itself. Simply put, The Phenom against The Vigilante at WrestleMania 32 would be more sizzle than substance. Next year, Undertaker will be 51; Sting will be 57. Both are far beyond their primes. Their athleticism is diminished; their speed dulled by time. The audience can't expect a great physical battle. It can't count on this bout being as good as it could have been had Taker and Sting clashed many years earlier. Fans know that and a number of the WWE Universe could not care less. They will be too busy observing two icons square off in a contest drenched with over-the-top spectacle befitting of WrestleMania. This will be more about names and personae. The plug would be tremendous as images of crows, lightening, baseball bats and caskets all swirl together. This is a dream match that some can't shake from their head, an idea that refuses to go away. The bout that once seemed like it would never happen is becoming increasingly likely. Undertaker's hometown of Texas hosts WrestleMania 32 as both men's career's threaten to come to an end. It's now or never for that of collision of colorful characters. SummerSlam 2015 will be one hell of an event.